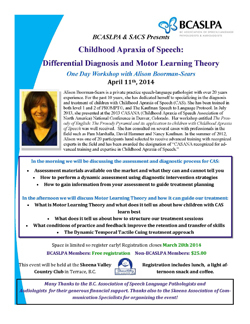 I recently provided a full day workshop for the BC Association of Speech/Language Pathologists and Audiologists (BCASLPA) entitled "Childhood Apraxia of Speech: Differential Diagnosis and Motor Learning Theory." I presented at the 2013 CASANA conference in Denver Colorado (July 11-13, 2013). My presentation "The Music of English: the Prosody Pyramid and its application to children with CAS" was well attended and received positive feedback. A half day (3 hour) workshop that covers the general treatment principles for working with children with Childhood Apraxia of Speech (CAS) as well as discussion of specific treatment approaches and how to determine which approach or combination of approaches may work for different children. A one hour workshop that discusses the reasons why sign language can be a highly effective treatment tool for children with Childhood Apraxia of Speech (CAS). Specific examples of how sign language can be used within treatment are presented. A one hour workshop in which the issues around diagnosis of CAS and how to distinguish CAS from a severe phonological disorder or severe dysarthria. A half day (3 hour) workshop in which the importance of treating prosody in Childhood Apraxia of Speech (CAS) is highlighted. It is very common for SLPs treating CAS to put prosody considerations on the “back burner” in the initial stages of treatment. This workshop will discuss the importance of addressing prosody from the very beginning of treatment and provide specific therapy activities for various stages of development. A two hour workshop which covers the challenges of diagnosis and therefore treatment of children under the age of 3. Often, we refer to these children as “late talkers” yet they may present with many of the characteristics of Childhood Apraxia of Speech (CAS). Frequently these children are producing few, if any, verbal attempts, complicating the issue of diagnosis further. This workshop will provide information on how to provide ongoing “diagnostic intervention” and how to ultimately provide the most appropriate treatment for these children. Cost for workshops includes the time alloted to the presentation of the workshop and prep time. Travel costs or lodging required due to location of the workshop will be charged in addition to the cost of the workshop. Please contact me to work out these details. Note that workshops can be combined to create a full day workshop to suit your needs (e.g., two half-day workshops can be combined to create a full-day workshop).